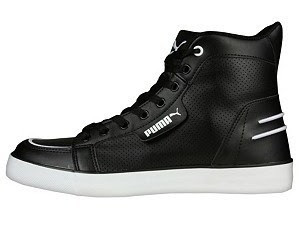 The Puma Hooper Mid men's retro shoes are just that; retro. In this case, they bow to the mighty basketball shoe, with an historic design that pays tribute to the hi-tops that came before it. The Puma Hooper Mid men's retro shoes have nothing to do with Mr. Hooper, beloved character from our Sesame Street youth. We think he would approve, though, if he was still around to see these kicks. Heck, he might have even decided to include these as part of the stock of his store, so all the kids could enjoy the cool comfort and style. We're not sure if they're available in Big Bird size, though. 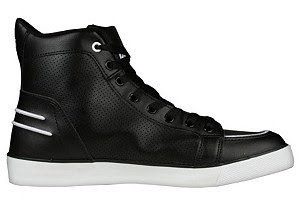 These shoes are all about the cool factor. From their breathable, perforated leather upper to their durable rubber outsole, the old-school lines and new-school comfort of the Puma Hooper Mid men's retro shoes will keep you smiling all day long. 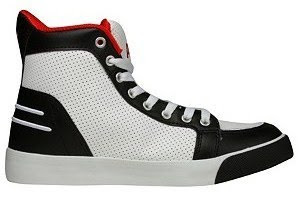 Hoops gave them their basic style, and Puma kicked it to 11 without blowing the speakers. 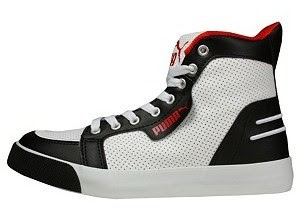 Make your fashion statement today in the Puma Hooper Mid men's retro shoes.